Azure Machine Learning Studio is Microsoft’s fully managed cloud service that allows users to build, deploy and share predictive analytics solutions. The simple browser-based, drag and drop tool minimizes coding effort, helping developers move from idea to deployment in a short period of time. 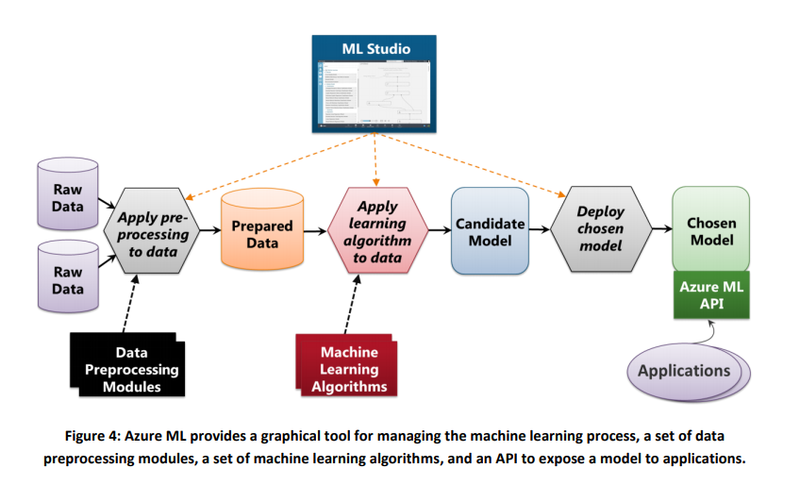 Azure ML studio includes several built-in packages and provides strong support to open-source language R, which is widely used to write machine learning algorithms. 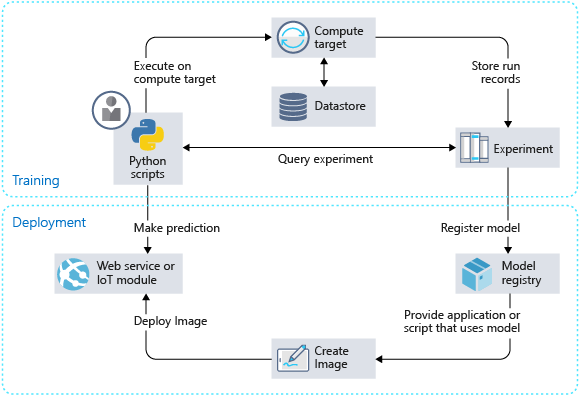 The objective of the Azure ML studio is to make it easy for developers to set up their experiment using modules that are preprogrammed with predictive modeling techniques. A visual work space that supports machine learning, starting from preprocessing data to deploying models. Using an interactive, visual workspace, you drag-and-drop datasets and analysis modules onto an interactive canvas. You connect them together to form an experiment that you run in Machine Learning Studio. You create a model, train the model, and score and test the model. 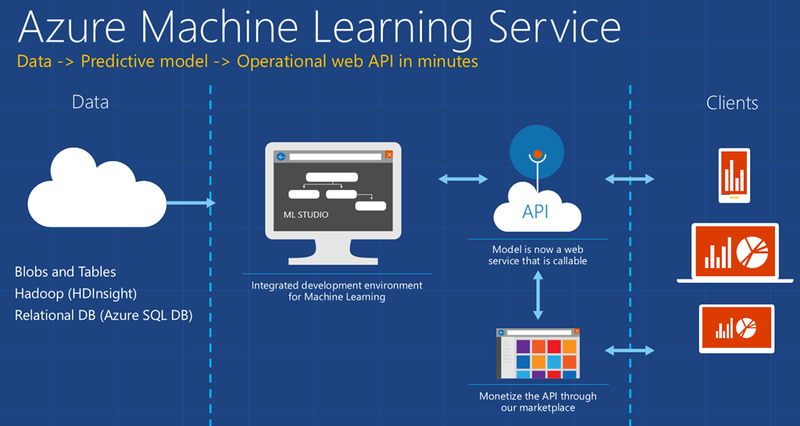 Azure Machine Learning Studio and Microsoft Azure Machine Learning Web Services portal help users quickly deploy and manage machine learning workflows and models as a web service without writing code. ML Studio, a graphical tool that can be used to control the process from beginning to end. Using this tool, people on the machine learning team can apply data pre-processing modules to raw data, run experiments on the prepared data using a machine learning algorithm, and test the resulting model. Once an effective model is found, ML Studio also helps its users deploy that model on Microsoft Azure. A set of data preprocessing modules. Unlike standard cloud computing services that charge users by the hour, Microsoft uses a per-seat subscription model for ML Studio. There are no upfront cost and termination fees. Free tier is great for customers who want to get an idea about the service. Customers can use datasets as large as 10GB and each experiement can run for a maximum of one hour. The biggest drawback is, there is no ability to deploy models into production. Standard tier costs, $9.99 per seat per month and $1 per studio experimentation hour. It gives access to all Azure ML features and unlimited storage space. The per-seat charge only applies to direct users of Azure ML. There is no fee for people who use applications that work on top of Azure ML models. For production models, Microsoft charges for every compute hour consumed by the model and for each API calls made to the model. For current Azure ML prices, please visit this page. Azure Machine Learning service is a web service offered by Microsoft to develop, train, test, deploy, manage, and track machine learning models. The cloud-based environment provides support to open-source technologies such as Scikit-learn, Tensorflow, Pytorch and Python-based frameworks. Managed Compute Services: Since the underlying infrastructure is managed by Azure, autoscaling allows users to increase and reduce the capacity on demand. Devops: Easy to track experiments, monitor and managed models, integrate CI/CD, and machine learning pipelines. Multiple Deployment options: Ability to deploy models on-premise and to the cloud. Python: Azure Machine Learning service is designed to integrate with any Python environment, including Visual Studio Code, Jupyter notebooks, and PyCharm. Open-source frameworks: Supports machine learning frameworks and tools, such as PyTorch, TensorFlow, and scikit-learn. Automated Machine Learning helps users to quickly select algorithms and hyperparameters. This feature helps users in a big way as it reduces the complexity of machine learning, associated labor hours and overall costs. What is it: Automated machine learning is the process of taking training data with a defined target feature, and iterating through combinations of algorithms and feature selections to automatically select the best model for your data based on the training scores. How it compares: The traditional machine learning model development process is highly resource-intensive, and requires significant domain knowledge and time investment to run and compare the results of dozens of models. The advantage: Automated machine learning simplifies this process by generating models tuned from the goals and constraints you defined for your experiment, such as the time for the experiment to run or which models to blacklist. Microsoft uses the pay as you go model for Azure Machine Learning service. You only pay for the resources you consume by the hour. No upfront cost and termination fees. Customers can choose from five different compute services, General Purpose, Compute Optimized, Memory Optimized, Storage Optimized, GPU and High Performance compute. Customers can save by reserving the infrastructure for a one-year or three-year term. For example, in the US East region, one-year reserved instance will reduce cost by up to 33% compared to pay as you go price, while a three-year reservation reduces the price by up to 49%.